Four Steps to a Perfect Application - SchoolFinder.com! So you've done your research, chosen your prospective schools, and are now ready to move onto the next stage of the pre-post-secondary process - applying to school. The application process for university and college can generally be broken down into four sections: the application, the essay, the portfolio, and the dreaded in-person interview. Some programs might use all four of these admission procedures, while others might just use one or two. Regardless, it's good to be familiar with all of them, just in case. This is the most basic method a university or college will use to pick its students for the next school year. Applications include all your vital information - name, birth date, etc. -as well as information regarding what program you're applying for, your academic credentials, and so on. It's incredibly important that you fill out your application completely and properly. An inaccurate or incomplete form, in some programs, could lead to an immediate rejection. Be sure to proofread your application several times before submitting. If you're unsure about anything on the form, don't just guess the answer - call the school's admissions office for help. 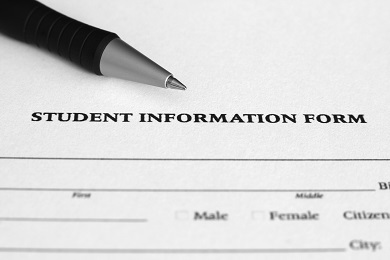 When submitting the completed application, be sure to include EVERYTHING the school asks you to, including the application fee, transcripts, letters of recommendation, etc. Keep copies of all these items, just in case something gets lost somewhere along the way or you need to refer to something later on. While many undergraduate programs choose their incoming students based solely on the merits of their application and transcripts, more competitive programs often want to get to know a little more about you before accepting you as a student. This is where the essay comes in. In most cases, you'll simply be asked to talk a little bit about yourself, your goals, your reasons for wanting to get into the program, and so on. The important thing to remember here is honesty - don't exaggerate your achievements or, worse yet, make them up. At the same time, though, don't be too modest. This essay is a chance to toot your own horn and sell yourself to your prospective school; to convince them why they should chose you as a student over the other 100 qualified applicants. You want to highlight relevant achievements in your life, but don't restate the obvious. They can see from your transcript that you received an A++ in home economics, so you don't need to mention it and other grade achievements in your essay unless there's something special behind the grade (you had to overcome a crippling fear of spatulas to get it, say). Instead, try and outline the qualities and achievements that you're truly proud of, that demonstrate something about your character, and that show them why you're suited to their program. It's fine to be creative and original in your essay, but don't overdo it. You want it to be memorable, not corny. Also, try to use fairly basic language - don't be pretentious, it won't score you any points with your readers. And, of course, make sure your essay is well-structured and devoid of any spelling or grammatical mistakes! In some programs - such as journalism or graphic design - the admissions officers need to make sure that, in addition to the grades and desire, you have the raw talent it takes to succeed. The way they do that is by asking you to submit a few pieces of your work - a portfolio - to show them what you can do. When putting together a portfolio, be sure to follow the program's instructions to the letter. The instructions should tell you if they want a digital portfolio, original hard copies of your work, photocopies, etc. And if they ask for 10-15 pieces of work, give them 10-15 pieces. I know it can be brutal to pick so few pieces to represent yourself, but sending more just shows them you can't follow directions. You also run the risk of seriously annoying the over-worked person stuck with reviewing your massive portfolio. On the flip side, sending in too few pieces also looks bad, since it calls into question your skills. If you're having problems finding enough pieces you think are good enough, considering getting someone you trust to help you. Maybe you're just being too hard on yourself - there might be something you think is awful that someone else would say is great. Aside from the number of pieces you send in, also be sure to send in a good range of work. That is, don't just send in, say, ten examples of poetry to a writing program. Even if it is your strong suit, you should still send in a few examples of other kinds of work - short stories, articles, etc. It doesn't have to all be perfect - after all, you are hoping to go to school to get better, and the admissions officers will have that in mind when assessing your work. Finally, try to keep your portfolio recent. Unless something you did ten years ago is just too amazing to leave out, it's best for your portfolio to demonstrate your current skill level. Once you've got your pieces picked out, it's time to organize them. Basically, your portfolio should be well-organized and easy to flip through, and each piece should be labeled (date, title, etc.). Again, creativity is good when it works, but don't go too nuts with crazy fonts and colours. In some programs, after you've made it past the application, essay, and portfolio rounds, a final in-person interview is done to determine whether you're truly right for a school. It's a chance for the people running the show to get an idea of the real you behind the transcripts and work samples. Understandably, then, for many students this is by far the most nerve-wracking experience of the whole process, since it means you have to do your best to impress a real person in real-life, rather than just on paper. Your goals in an interview situation are simple: you want to show you have good communication skills, a desire and ability to succeed in the program, and a general awareness of whatever field you're hoping to get into. To do this, you need to do a couple of things before the interview. First, take some time to practice your answers to some common interview questions. You don't want to sound too rehearsed, but you should be prepared to describe yourself to the interviewers succinctly and tell them a bit about your achievements and goals for the future. It's also a good idea to be aware of general and industry-related current events and your thoughts on them. On the day of the interview, make sure to dress for success (that means no jeans and t-shirts) and show up at least a few minutes early. Showing up late doesn't make a very good first impression. If you're going to a school you've never been to before, either give yourself lots of time to get there and find the room, or do a trial run the day before to ensure you don't get lost on the day of the interview (which is not an acceptable excuse). During the interview itself, be honest with your answers, don't interrupt the interviewer, and try to refrain from simple 'yes' or 'no' answers and other noncommittal grunts. If a question seems to come out of left field - for example, 'when was the last time you felt angry, and how did you deal with it?' or 'if you could be an animal, what animal would you be and why?' - try not to get too flustered, and just answer as best as you can. Often, these weird questions are just a way to see how you react under pressure, how creative you are, and other psychological stuff. When it's all over, it's a good idea to have a few questions of your own to ask the interviewers. Maybe ask them how long it'll be until they make their decision, how many students they expect to accept, or some other well-thought out question. Don't ask them something you could easily find by flipping through the program's informational material - that just makes you look unprepared. Once the interview is finished, thank the interviewers for their time, and take your leave stage left. Now, you move onto the next stage of your post-secondary journey - waiting anxiously to find out if you got in. Try not to stress out too much about it, and keep your fingers crossed.